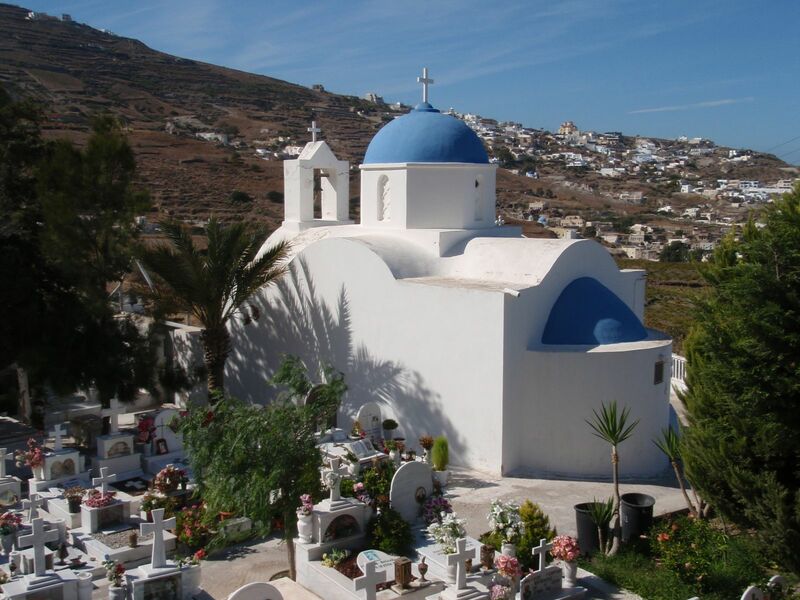 Whether you are a religious person or not, temples and other religious structures are often some of the most interesting places to visit while you are traveling. Not only that they are beautiful and architecturally incredible, but they also can tell a story about the local history and culture. Many thanks to our fellow traveling bloggers for participating in this post. We gave them difficult task to choose only 3 from so many wonderful temples from around the world! As we received the emails, we saw one by one our favourite temples were taken, for example La Sagrada Familia in Barcelona, the Borobudur Temple in Java Island, Hagia Sofia Mosque in Istanbul, Kiyomizu Dera in Kyoto, and Chichen Itza in Yucatan peninsula, Mexico. But even without the taken ones, we still have many more than just 3 top temples in our mind. It was pretty hard to narrow it down to only three, and I bet our contributors faced the same struggle. So, let’s let our kind participants take you on a journey visiting their favourite temples in the world! 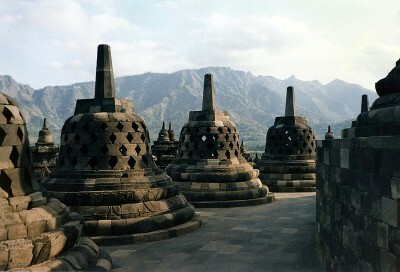 Borobudur: Huge Buddhist monument surrounded by mountains on Java, Indonesia.Â The relief panels are amazing, and the stupas are so unique. 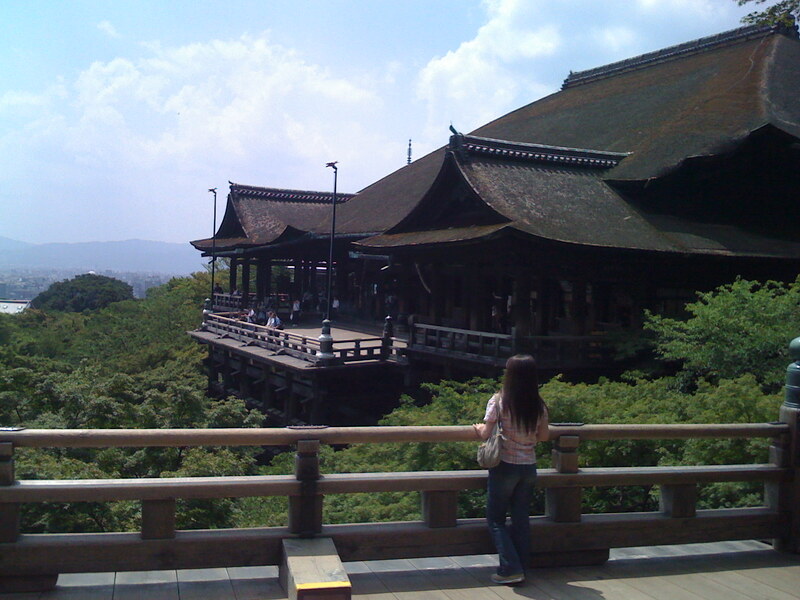 Kiyomizu-dera: Buddhist temple complex consisting of many distinct buildings.Â On a beautiful hillside in Kyoto, Japan.Â I really loved this place. Kiyomizu-Dera, Kyoto, Japan. Â© Jenna Fransisco. Prambanan: Awesome Hindu temples on Java, Indonesia.Â The sculptures and carved temples are mesmerizing.Â Like Borobudur, it was abandoned for centuries, was discovered in the 19th century, and was looted.Â A really interesting story! 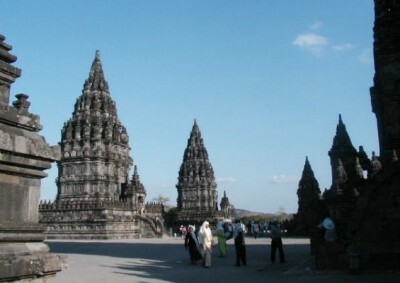 Prambanan Temple, Java, Indonesia. Â© Jenna Fransisco. Golden Temple (Amritsar, India) – I visit the Golden Temple on every visit to India simply because it offers a vibrant, hospitable, stunning setting without the masses of travelers that flood some of India’s other sights. 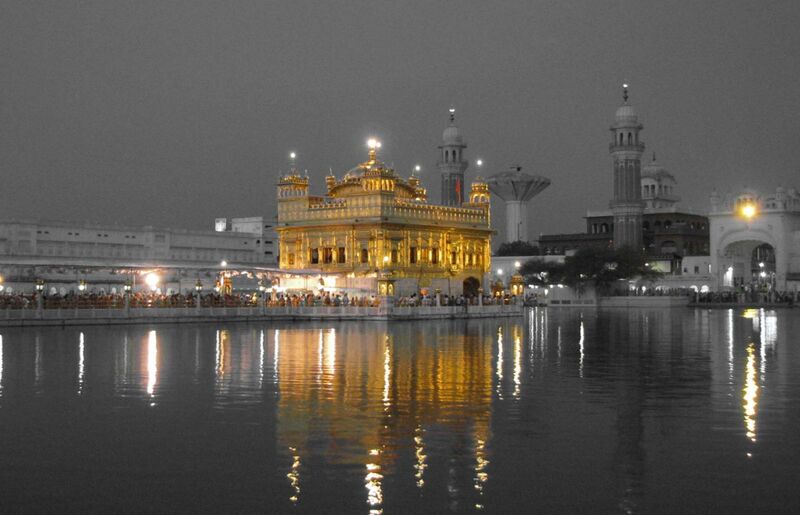 Add when the temple begins to glow at sunset, I just take a seat on the marble walkway, along with the hundreds of colorfully-dressed devotees of Sikhism, and enjoy an unforgettable atmosphere. Golden Temple, Amritsar, India. Â© Wandering Earl. Ananda Temple (Bagan, Myanmar) – The last thing I expected when walking through the simple-looking entrance of this ancient temple were four massive, brightly glowing, standing Buddha statues offering me a serene welcome. And it proved to be more than just a welcome as, two hours later, when I finally walked back out into the 110 degree Burmese heat, I felt as if I had just awoken from a deep and powerful meditation. Ananda Temple, Myanmar. Â© Wandering Earl. Coba (Quintana Roo, Mexico) - Isolated and seldom-visited, the ancient Mayan city of Coba consists of an impressive collection of ruins, including various temples and the tallest Mayan pyramid on the Yucatan peninsula, all set in a dark, windy, mysterious section of Mexican jungle. Climb to the top of the pyramid and you’ll never want to come down – either because you’re mesmerized by the views or you’re too afraid to navigate the tiny steps! Earl in Mayan ruins of Coba. Â© Wandering Earl. Maccu Picchu: Cusco, Peru - After first visiting Cusco this past February, I was dissapointed to know I’d be leaving Peru without seeing these famous ruins. Towards the end of my backpacking journey, around April, I was so inspired to visit that I changed my flight just to go back when it reopened. Teresa in Maccu Picchu, Peru. Â© Art of Backpacking. The pictures tell why it is such a popular visited tourist attraction. 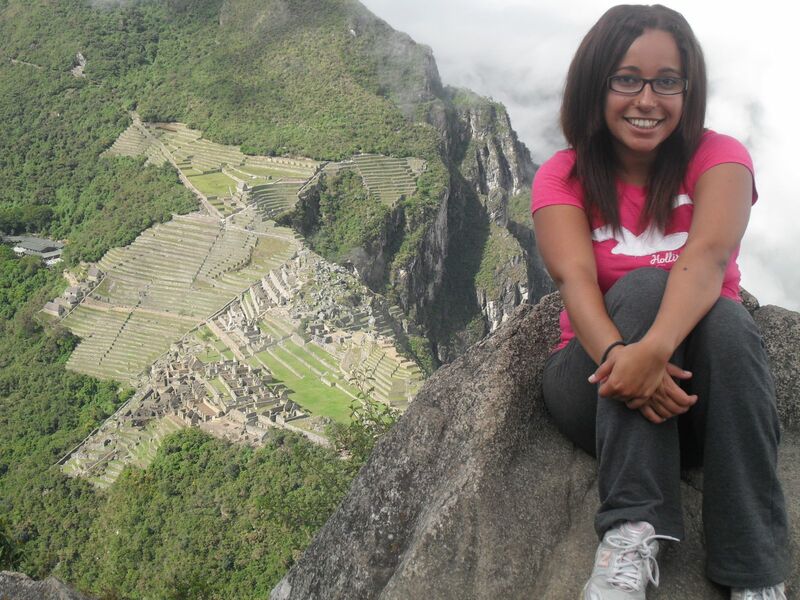 Especially the hike up Huayna Picchu as the sun rises and the cloud forest fades to reveal the perfect postcard photo. Who would have thought Incans would build such a beautiful civilization in such a peculiar place! It is a must see for anyone before mother nature messes with it again. Santa Catalina Monastery: Arequipa, Peru - The world renowned covent has such a rich history worth delving into. Located in the city center, the Monastery is still home to practicing nuns. Most of the complex is open to the public where one can learn how visualize how these high class Spanish nuns lived. It’s easy to get lost observing the beautiful architecture and the spiritual ambiance of the religious enviornment. 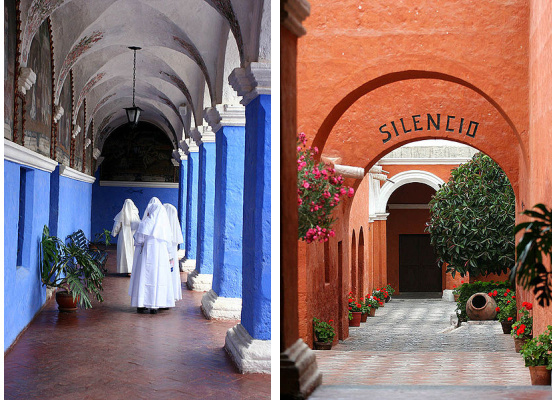 Brightly colored walls, high ceilings and blooming gardens invite tourists to escape into another world. Â It takes you back to a simpler time where clothes are handwashed and one lived simply with the clothes on their back and a bed; kind of like a backpacker! La Sagrada Familia: Barcelona, Spain - It’s pretty amazing when a beautiful structure such as La Sagrada Familia is actually a work in progress. Even more so, not yet to be completed until 2026. 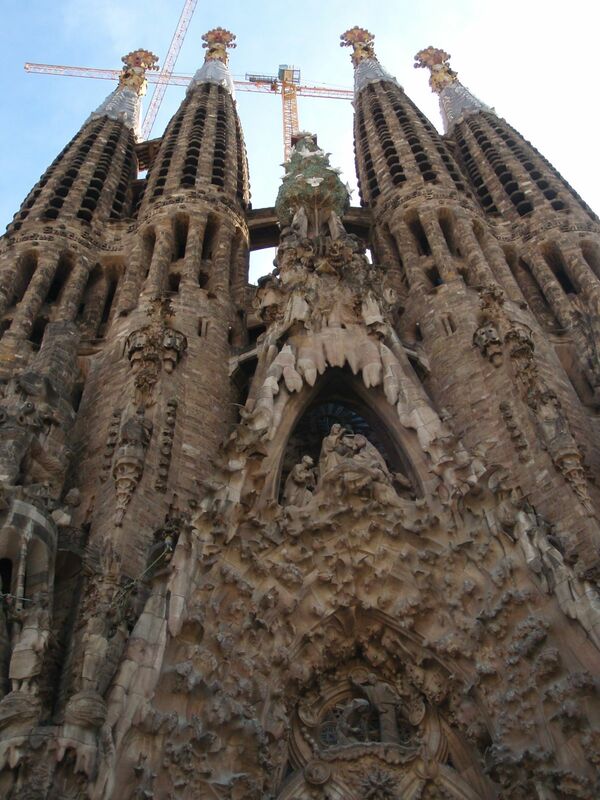 The religious masterpiece of Gaudi is the iconic symbol of Barcelona. The infastructure itself can be seen all over the city; which makes it hard to miss. Â You are left simply in awe by the specific eye to detail, the church itself and of course, watching construction men work all day trying to get their job done. Who isn’t intrigued by such an intricate work of art that promises more? 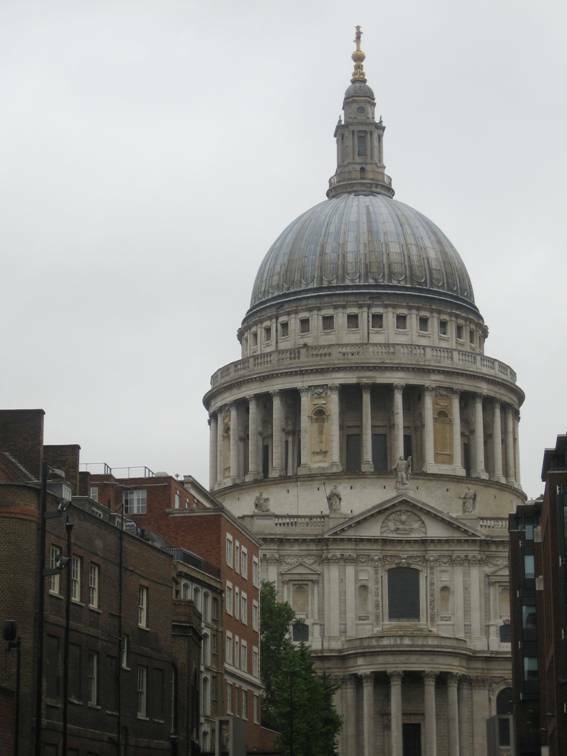 I’d love to stick around and visit again when the iconic church is complete. 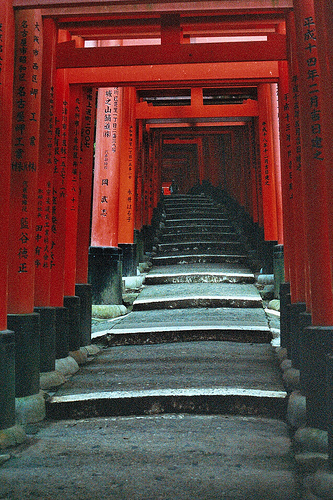 Fushimi Inari (Kyoto, Japan) – The head shrine of Inari (the god of business) is easily recognizable from the thousands of orange and blacktorii lining the paths. Each of the torii were donated by a specific business so that they may be blessed with wealth. Fushimi Inari Temple, Kyoto, Japan. Â© Over Yonderlust. Stonehenge (UK) – Although we don’t have a complete understanding of Stonehenge, I believe it is an appropriate addition to the Religious/Spiritual Structure list. It is believed to have been a burial ground, however neo-pagans/druids/etc. currently visit it as a pilgrimage site. 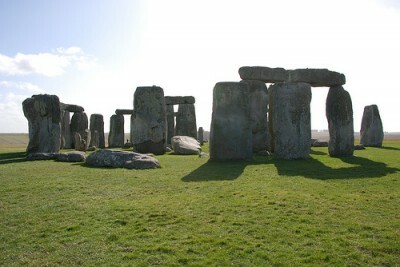 Stonehenge, UK. Â© Over Yonderlust. Segovia Cathedral (Segovia, Spain) – While you do have to make a small hike up some hills to the top of Segovia, the summit is well worth it. This awesome Roman Catholic Cathedral dedicated to the Virgin Mary is open for tours (a few Euros to enter) and has amazing Gothic architecture and art. 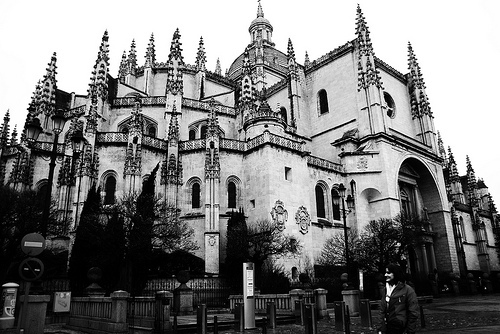 Segovia Cathedral, Spain. Â© Over Yonderlust. 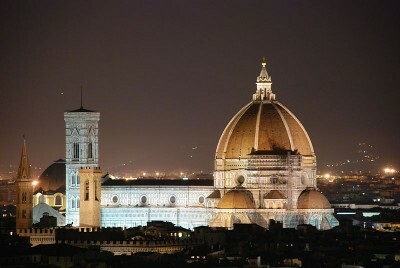 The Duomo in Florence, Italy – There is nothing that prepares you for seeing the Duomo in person. 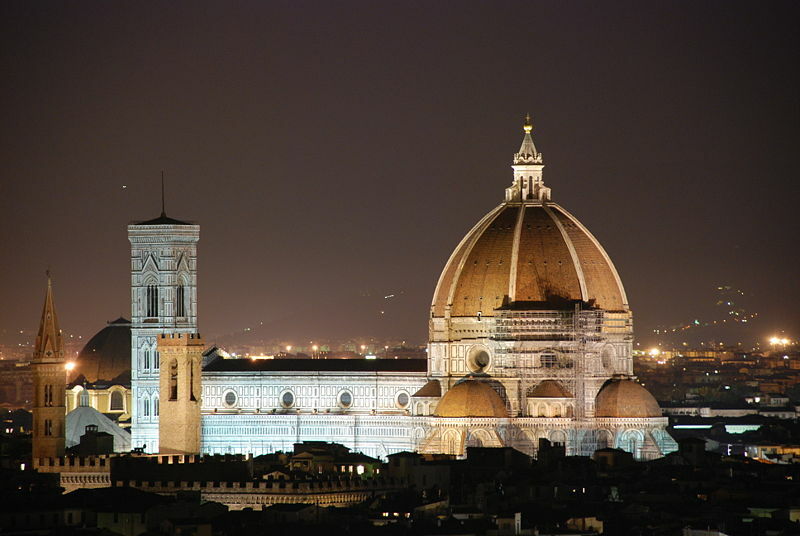 Â I studied it for years in my art history courses, saw it on multiple times on travel shows (thank you for making me jealous, Rick Steves) and stared at it in guidebooks while planning our trip to Italy…yet I was still overwhelmed when I visited Florence. Â The exterior is far more beautiful than can ever be captured in a photo, and the way it subtly changes color as the day goes on is breathtaking. Â I couldn’t get enough of walking by the Duomo everyday. Â And I haven’t even discussed the interior! Â Taking the tour up to the top of the tower allowed me to get up close to the amazing frescoes high inside the dome, and made reading Brunelleschi’s Dome well worth it. Â I’ve never met another building that I was so fascinated by. Chichen Itza on the YucatÃ¡n Peninsula – The best decision we made when visiting was getting there early. Â Walking through the ruins before the crowds from CancÃºn arrive is the best way to experience Chichen Itza. Â While these are some of the most visited Mayan ruins, they are also in great condition and well worth the trip. Â El Castillo is the first structure you’ll see as you enter the site. Â It soars over its surroundings, and I was really surprised to learn that they didn’t stop allowing people to climb to the top until 2005! Â I imagine it got rather dangerous on crowded days. Â My favorite buildings in Chichen Itza were the “nunnery” and “church.” Â They’re small but full of beautiful detailed work. Â And to top off a wonderful visit, we were engulfed in swarms of lovely yellow butterflies as we walked through the ruins – imagine a butterfly house, minus the house – it was magical. 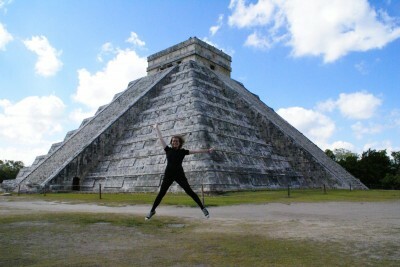 Ashley jumping in Chichen Itza, YucatÃ¡n Peninsula, Mexico. Â© No Onion Extra Pickles. 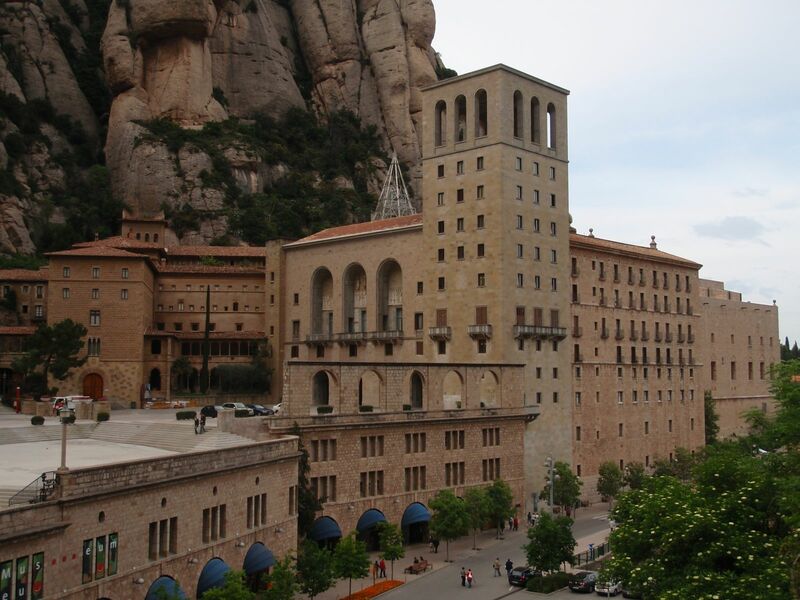 The monastery in Montserrat, Spain – Taking the train from Barcelona, traveling to Montserrat was a well needed break from the city. Â Perched high up on a mountain top, the star of the show is the contrasts between the uniform monastery buildings and the incredible rock formations surrounding it…though the views are a very close second. Â We had a great afternoon, hiking all through the area around the monastery, visiting various sacred points. This is also a popular trip for Catholics pilgrims – they come to see the Black Madonna – and I cannot resist a pilgrimage site! Â Plus, the food in the cafeteria was pretty good, and we also bought some beautiful ceramics from the shop, for a fair price. 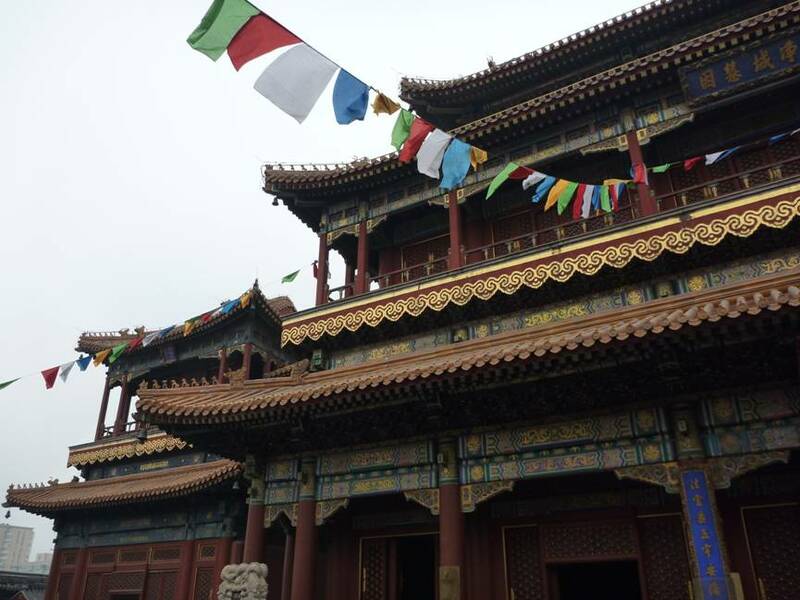 Yonghe LamaÂ Temple (China) – The Yonghe LamaÂ Temple in Beijing is a Tibetan Buddhist Temple that was formally a royal residence.Â The complex itself is stunningly beautiful, so bright, colourful and inspiring, standing out from the dull grey that is most of Beijing! One of the best parts of this temple is the museum containing hundreds of fascinating Tibetan Buddhist relics. Yonghe Lama Temple, China. Â© On Ur Way Travel. 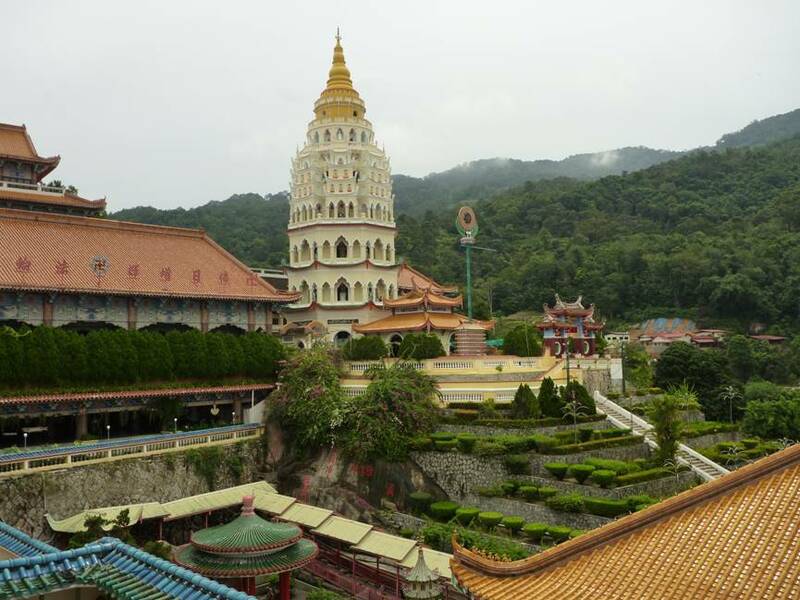 Kek Lok Si Temple (Malaysia) - Kek Lok Si Temple is a spectacular Chinese Buddhist temple perched above George Town, in Penang, Malaysia.Â The sheer size of this temple was amazing not to mention the crowning jewel, a 37m high bronze statue of the Goddess of Mercy. Kek Lok Si Temple, Malaysia. Â© On Ur Way Travel. St Paul’s Cathedral (UK) – St Paul’s Cathedral stands tall, towering above the dull skyline along London’s Thames River.Â I was enchanted by the architectural details of the exterior but the moment I stepped inside was the moment I was blown away!Â After all this was the cathedral chosen as the place to wed Prince Charles and Princess Diana breaking the tradition of royal weddings being held at Westminster abbey. St. Paul’s Cathedral, UK. Â© On Ur Way Travel. 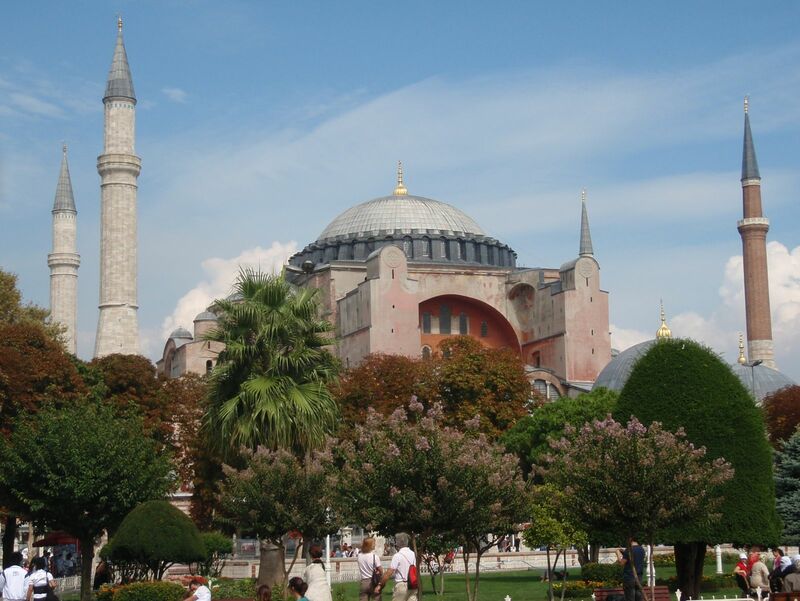 Hagia Sofia (Ayasofya) - Literally a blend of traditions, cultures, and religions the building is extraordinary. A mosque built on top of a Byzantine Church it reflects the mix of cultures in Istanbul. 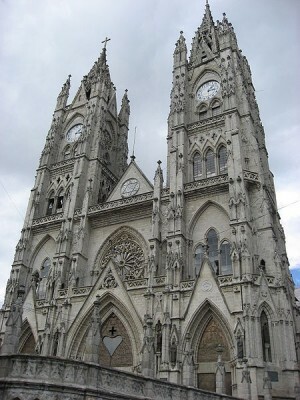 La Basilica Church, Quito, Ecuador – The climb up to the top of this church is an adventure in itself. Making your way across the church’s arches and climbing several ladders nearly 100 meters off the ground, the view from the top perch is well deserved, if not a bit scary! Akshardham Temple (New Delhi) - The exterior is completely carved with small and large depictions of animals, people, and deities. The attention to detail that was required to build such a magnificent site simply boggles the mind. 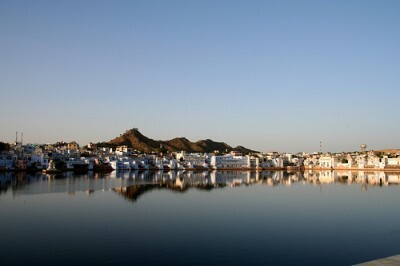 Pushkar, India – the city itself is kind of a temple, is the only one in India dedicated to Lord Brahma. It lays in the Rajastan desert and the lake is sacred. There you can visit Brahma Temple and climb two steep mounts, and on the top of them find Savitri andÂ Saraswati Temples and the views up there are so beautiful. Just amazing special place. Pushkar, India. Â© No Place Like Here. Crazy Hindu temple Dharamsala, India – we don’t know the name of this one, but it was so crazy, you enter through a lion’s mouth and exit by a crocodile’s mouth, the temple looks like a thematic park, you walk through a dark cave and it’s all so colourful… there are images of many many Gods inside and on the terrace, and the statues are also very different than anything else we saw in India. Dharamsala, India. Â© No Place Like Here. 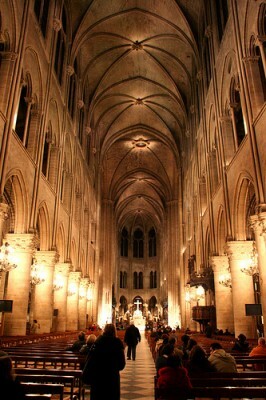 Notre Dame, Paris – We were already amazed of the church itself when we entered, when suddenly a girl starts singing, and the acoustic was just impressive. All we could was sit, listen and meditate. Unforgettable. Notre Dame, Paris. Â© No Place Like Here. 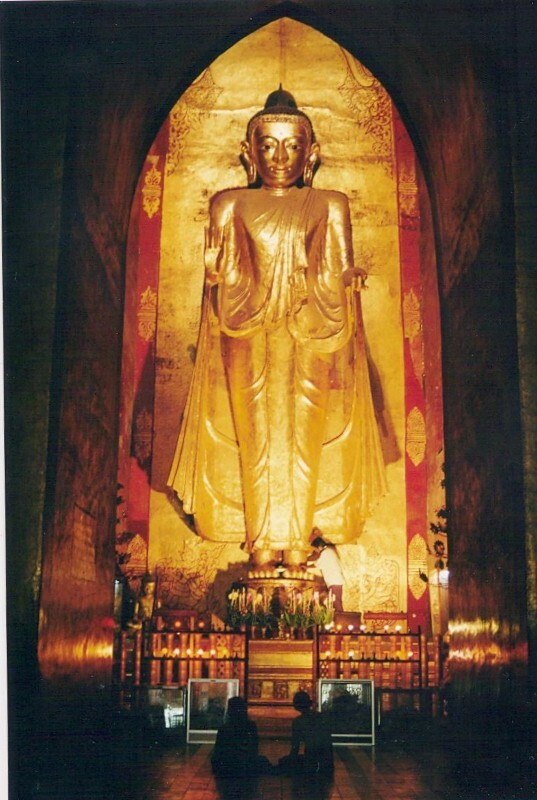 Shwezigon Zedi (Bagan, Myanmar) – On a sunny day the gold from the temple walls can be blinding. The temple has been restored to all its former glory. I was absolutely amazed at the amount of money the government here spends on restoration. This shot was taken from a hot air balloon early in the morning. 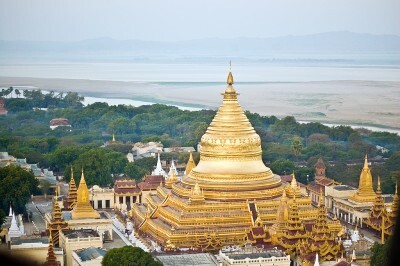 Shwezigon Zedi, Myanmar. Â© Budget Travelers Sandbox. 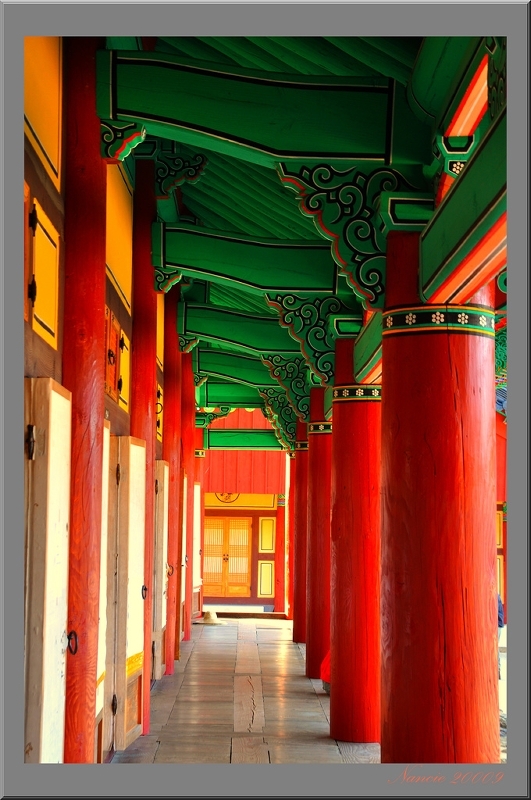 Jiri-sanâ€™s Hwaeomsa Temple (Korea) – Hwaeomsa Temple is one of the most important temples in Korea, dating back to the Silla Dynasty (544). They offer an English Temple Stay Program that allows visitors to experience authentic temple life. Be warned, first call to temple is around 4am.! Magical! 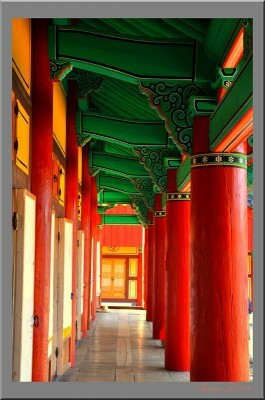 Hwaeomsa Temple, Korea. Â© Budget Travelers Sandbox. 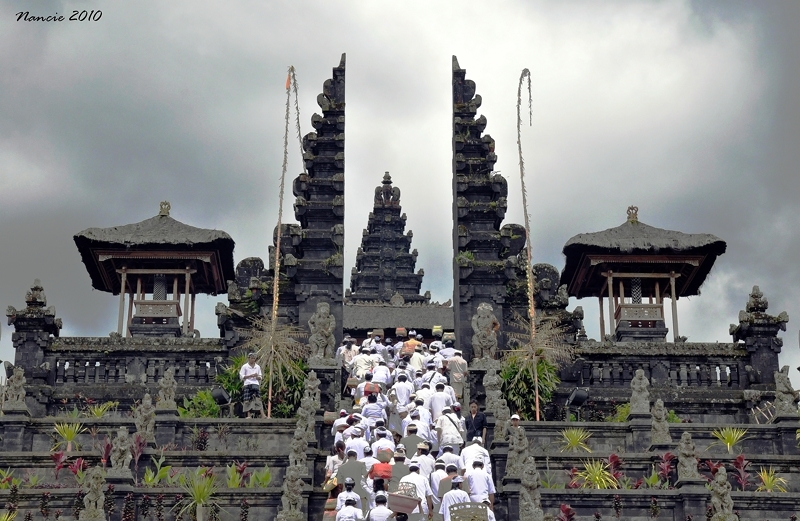 Pura Besakih, Baliâ€™s Mother Temple - Located high on the slopes of Mount Agung this is Baliâ€™s most important temple complex. We were lucky enough to visit on a day when there was a major festival going on. Worshippers were arriving by the thousands, which made for some great photo opportunities. One warning hereâ€¦â€¦â€¦â€¦be prepared for the touts. They are relentless. Pura Besakih, Bali. Â© Budget Travelers Sandbox. White washed blue domed churches ofÂ Santorini – If you come to Santorini or some other Greek island nearby, it’s easy to fall in love with these pretty little churches.Â Their whitewashed walls are perfectly integrated into the cities they serve, not dominating the skyline but just blending in with the decoration of a little blue dome on top. In many cases the interior can only fit ten or twenty people, and is always lavishly decorated with orthodox-style paintings of Madonna and the baby Jesus. White washed blue domed churches of Santorini. Pura Luhur, Uluwatu, Bali - This Balinese Hindu temple was built in the 11th century on a stunning cliff, about 100 meters above the sea level. We fell in love with this temple and the setting for its stunning sunsets. 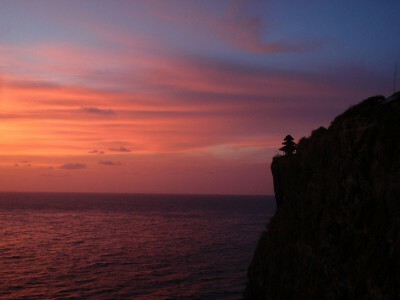 Stunning sunset at Uluwatu Temple. The Temple ofÂ Zeus in Olympia, Greece – This ancient Greek temple was built on about the 5th century BC inÂ the large temple complex in Olympia, the site of the ancient Olympic Games was celebrated. In this temple ruin, once the world famous 13 m tall ivory and gold plated bronze Statue of Zeus by Phidias, one of the seven wonders of the ancient world, stood. My favourite moment was looking at the ruins, trying to imagine how it used to look long ago, with the glorious temple columns and statue of Zeus sitting in the middle. This temple showed us of how the origins of sports were religious, something that isn’t often remembered today. Temple of Zeus in Olympia. Left: the ruin as we saw it. Middle: an illustration of what the temple might have looked in the past (Source: LÃ¼bke & Semrau, public domain). Right: Statue of Zeus in Hermitage Museum, based on the famous Phidias’ work (Photo by Sanne Smit, public domain). Ayngelina from Bacon is Magic: Angkor Wat, Cambodia – It should be at the top of everyoneâ€™s list. Other temples just havenâ€™t lived up to the overwhelming feeling of going there. Danielle from Cracking the Egg: ZhiNan Temple (æŒ‡å—å®®) in Taipei, Taiwan – Itâ€™s set on a mountain side with many tea shops in the area. Beautiful place that is only a hop skip and a gondola ride away from the city. What do you think about our picks? Is your favourite temple not mentioned yet? Share with us and we’ll update the post with your favourites! What are your 3 most important pieces of traveling advice you would like to share? Some people believe traveling light is the way to go, while others love to travel with complete gear. Some like to plan the traveling route in details, some like to play by ear. Some don’t want to miss out any important landmarks and treat Lonely Planet guidebooks as a bible, while others avoid guidebooks and go with local’s suggestion. Whatever your traveling style is, what advice would you give to other travelers? Please participate, everybody is welcome! Submission deadline: Saturday, July 17th, 2010 (all time zone). That’s about 2 weeks from this post date. Send your answers to dina(at)vagabondquest(dot)com. Include your (nick)name and your blog URL (so I link back to you). Need more info? Give me a shout! at least, I’ve visited 6 of them…. That’s cool, 6 is a lot! Which ones? Another great collection! There are many structures here that I wasn’t familiar with until now. Thanks for including my submission. .-= Jenna´s last blog ..10 Things I Love about Brazil =-. Thanks Jenna, and we love to have you in the post I love your selection up there, Kiyomizu and Borobudur are really high in my list. Prambanan is too I’ll fix the Borobudur caption. It’s tough reading this post as I want to experience all of the temples above that I’ve yet to visit…right now! Such an excellent collection. And I’m really curious about the “Crazy Hindu temple” in Dharamsala as I spent a good amount of time up in that town and somehow missed it! On a side note, I’m glad to see you survived your adventures into the Australian rain forest! .-= Earl´s last blog ..The Perfect Camera For A Nomad =-. .-= Cris Campos´s last blog ..Braaasiiil- Ronaldo- =-. Thanks Cris, that makes sense then! My long stretch in Dharamsala/McLeod Ganj was in 2006/2007. But I go back often so on my next trip, I’ll be sure to visit! Hi Cris and Earl, I definitely want to get through the lion and croc mouth too Sounds so wacky! And Earl, I’m glad I survive all those salt water crocs in Daintree river We saw one that is 5 m long (people call him Fat Albert). I think the crocodile in Dharamsala is friendlier! Oh wow, what an amazing list! Thanks so much for inviting us for this. As you mentioned, it’s so hard to select the top 3. We chose the ones that we had an unforgettable experience at, not only for the place itself. Above that, I think NATURE is our preferred temple of all. We have visited only 4 of the other 27 temples here.. I’m taking notes NOW so we can visit the other 23!! Which other 4 have you visited? About nature, you must love living in Wellington so much! Not only it’s so close to many nature beauty, Wellington itself is beautiful as well! I went to Red Rock to see the seals in Wellington the other day, it’s amazing to be able to see wildlife in such a stunning location, just a short drive from the downtown! True, I do love living in New Zealand for that, but I think every place in the world has something special! I still can’t believe we missed the chance to meet each other over here. Maybe we’ll have another opportunity? 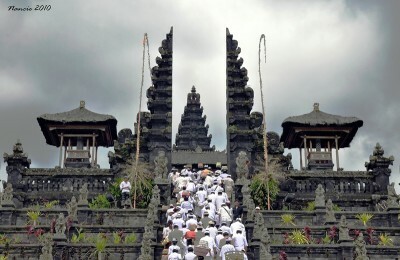 The other 4 temples of the list that we’ve visited were Machu Picchu (Peru), Gaudi’s Sagrada Familia (Barcelona), Ulu Watu Temple and Pura Besakih (Bali). I know! Time went so fast and I was in Wellington for such a short period of time. Remember the crazy hail rainstorm we got that time? NZ is just so pretty, and with so many places we didn’t get the chance to visit yet. It won’t be surprising if I go there again, and then we can meet up! What a sensational collection of ‘temples’, and a great website, too. I will be thinking of the temples I have visited, and dreaming of the ones I want to see. Thanks! .-= Carol @trekdigest´s last blog ..Basilica Cistern in Istanbul =-. Hey Carol, thanks! I haven’t visited many of these either, and definitely want to see all of them someday! Angkor Wat should be at the top of everyone’s list. Other temples just haven’t lived up to the overwhelming feeling of going there. .-= ayngelina´s last blog ..Three places for gringo food in Leon- Nicaragua =-. I really love ZhiNan Temple (æŒ‡å—å®®) in Taipei, Taiwan. It’s set on a mountain side with many tea shops in the area. Beautiful place that is only a hop skip and a gondola ride away from the city. .-= Danielle´s last blog ..Whatâ€™s Hotter than the Philippinesâ€¦Taipei =-. The list is great because of participants like you You took 2 of my favourites, Montserrat and Chichen Itza, love them. I too, have a lot of work to do!! D’oh! I haven’t been to ANY of these places. I better get started. Ryan and Dina, I love this series. Apologies for us flaking out on this one. Hahaha, you and Jen are going to start soon though, right? Where will be the first destination? Glad to know you like the series It won’t work without helps from you guys! Must visit all – Must visit all – a mental note. I have seen some of these but hardly all of these……What a fantastic list! 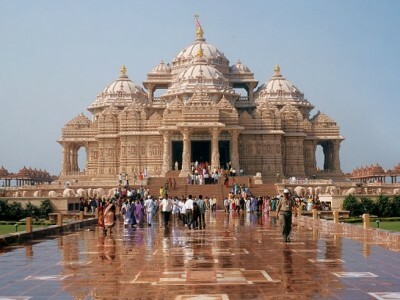 Temples have little to do with religion because they offer peace universally to all who come to pay their visits and respects…..I love visiting temples! We’ve been to so many of these temples. What a wonderful reminder. We are partial to the temples in Myanmar and yes, the Golden Temple of Amritsar is one of our favorites. Love that shot in half black and white and half colour by Earl. Awesome. .-= Dave and Deb´s last blog ..Chateau Dâ€™If in Marseille- France- Photo Friday =-. Hi Dave and Deb, I hope one day I could say I’ve been to many of them as well! We haven’t done much of Asia inland. I agree, that picture is really beautiful, emphasizing in the golden-ness of the temple. I want to see that someday! I agree what you say about the touts at Pura Besakih. It totally ruins the experience; shame really! Wow, you’ve got loads here! 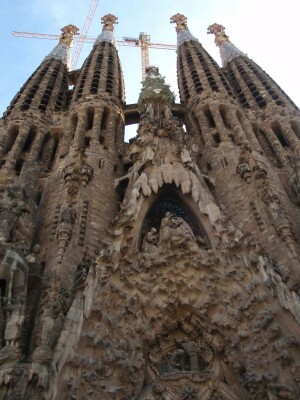 I loved the Sagrada Familia when I was there – so beautiful and detailed. Crazy to think it’s not even finished yet too. I’ve got a long way to go before I see all the ones on your list but thanks for the inspiration!